The Temple of the Emerald Buddha is the best known of the Thai Buddhist temples, the statue it houses is the most venerated of the whole country. It is thus a high place of the Buddhist religion that we find there. Recall that it is in the enclosure of the royal palace, at the corner North-East. 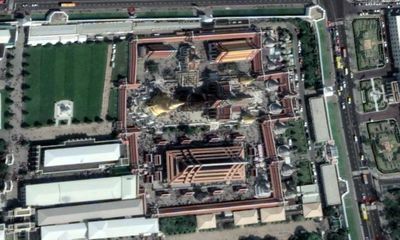 For a temple of this size, the temple of the Emerald Buddha is rather small when compared to other architectural elements of this size. It occupies an area approximately 150m square. Its limits are those of the large gallery that winds around, except for the eastern part of which six of the eight prangs are on the other side of the gallery. A prang is a kind of tapered Khmer style tower. The ubosoth, which contains the Emerald Buddha, is 26m wide by 62m long. The terrace on which it is perched is 75m long and 35 wide. The library is a fairly small square building, it measures 14m on the side. The Royal Pantheon is 55m by 30 wide. It has a cross shape. The library terrace, to its north, is 40m wide by 105m long. Compared to the 150m wide of the temple, and considering that it is precisely in the axis of this terrace that it is the least wide, there is little space between the gallery and the buildings that are there. Moreover, in case of affluence, there is a lot of people around here. If we compare the temple of the Emerald Buddha with other important World Heritage sites we can only see that it concentrates on a rather small space a great number of wonders. Indeed, the quality of the buildings, their beauty as well as their cultural and religious scope make it an absolutely beautiful place in a small space. 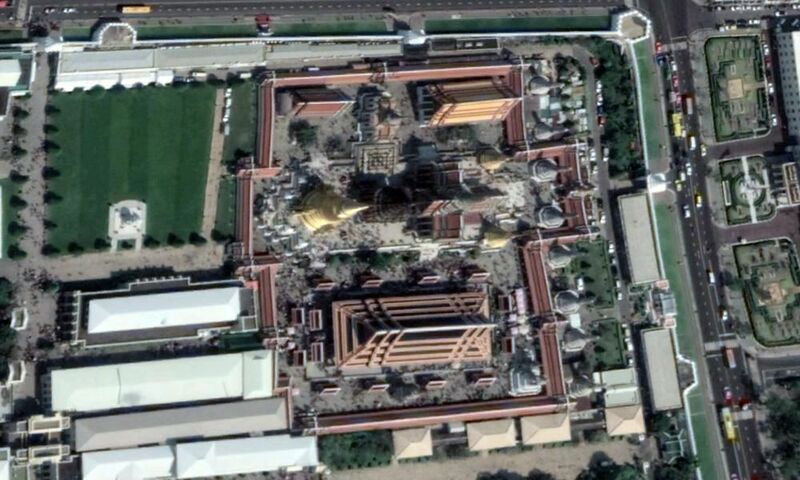 For comparison the forbidden city, magnificent royal palace of the Chinese emperor during the Ming and Qing dynasties is much larger (more than one kilometer long and 600m wide), but despite its architectural richness it not the golden beauty of the Temple of the Emerald Buddha. Also the Tower of London, London's famous fortified citadel, and certainly historically interesting, but we are very far from the standards of beauty. It must also be said that it is a citadel, not a temple ... But for the sake of comparison, the Tower of London measures 300m on one side, roughly. A pyramid of Egypt, built during the 1st Empire, 4500 years ago, was actually the main piece of a much more complete tomb, each pyramid was a funerary complex that could be up to 500m long by 300 wide. This means that mankind has always built buildings that are sometimes gigantic, sometimes powerful, sometimes refined. The temple of the Emerald Buddha in Bangkok is mostly chiseled.